PEBBLE BEACH, CA — Pebble Beach Resorts is proud to welcome technology industry leader IBM to its family of brand partners, in the role of its new Official Cognitive Solutions Provider. 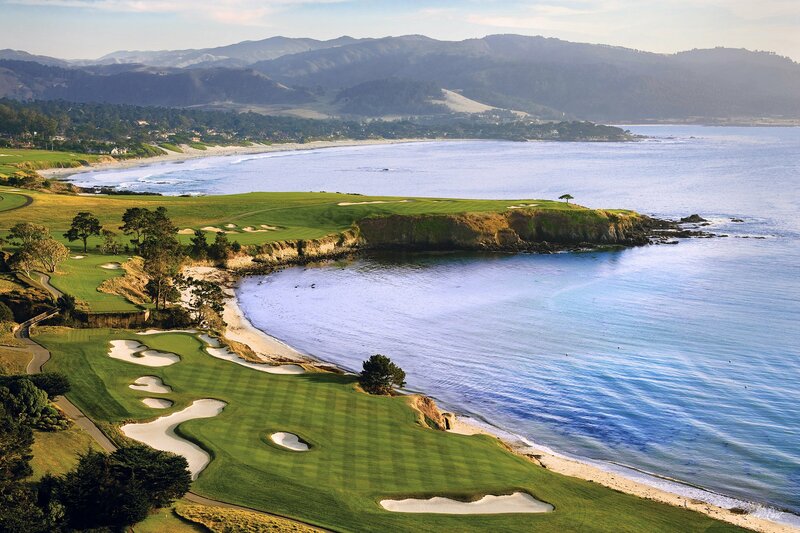 As part of this relationship, the two companies have launched a new Pebble Beach app built with IBM Watson’s cognitive capabilities, which will enhance the way Pebble Beach Resorts guests experience 17-Mile Drive, shopping, dining and more. As part of the partnership, IBM and Pebble Beach have collaborated to develop the official mobile app of Pebble Beach Resorts. The app is embedded with Watson’s Conversation API, which enables visitors to experience Pebble Beach as if they’re traveling with a local guide. To illustrate to guests what that experience looks like, IBM has enlisted the adventurous couple, big-wave surfer Laird Hamilton and professional volleyball player Gabrielle Reece, to visit Pebble Beach and share video and photos on social media platforms that show their use of the new app. Virtual Concierge: A conversation with the Watson-enabled concierge feature will help guests discover the many dining and shopping options throughout the Pebble Beach properties. By tapping into the Watson Conversation API, the app can provide answers to requests such as, “Where can I get a burger?” or “I need a souvenir for my daughter.” The technology uses frame-based dialoguing, where several options are presented versus command-and-response as seen in other machine learning technology. Tours of 17-Mile Drive: Guests can experience one of the world’s most iconic drives along the California coast via two curated tours: a full tour of the entire 17-Mile route and an express tour for guests who want all the highlights in a shorter time frame. Create My Story: Guests can create a 60-second souvenir movie of their Pebble Beach experience, using their own photos, then instantly share it on social networks. Explore the Resort: An interactive resort guide helps discover dining, shopping and scenic options at Pebble Beach. Guests can browse points of interest by category, or tap around the map to read menus, make reservations and get directions to favorite locations around the resort. Today at Pebble Beach: This feature gives guests information about daily events happening across the resort, and allows them to set calendar reminders. Alerts and Notifications: Guests can opt to receive promotional push notifications about special food and retail offerings throughout the Pebble Beach Resorts properties. In addition to bringing Watson to Pebble Beach guests through the official mobile app, Pebble Beach and IBM have also collaborated by deploying IBM Planning Analytics to help Pebble Beach manage its retail operation with smarter and quicker data analysis. With IBM Planning Analytics in the IBM Cloud, Pebble Beach has been able to capture a more accurate view of its retail operations and plan future merchandising decisions to boost the shopping experience, reduce costs and generate increased sales. IBM joins a collection of world-class Pebble Beach Resorts brand partners including Avis, Coca-Cola, E-Z-GO, FedEx, Jacobsen, Lexus, Rain Bird, Rolex, TaylorMade Golf Company and XOJET. About Pebble Beach Company — Pebble Beach Company, headquartered in Pebble Beach, Calif., owns and operates the world-famous Pebble Beach Resorts®, including The Lodge at Pebble Beach™, The Inn at Spanish Bay™ and Casa Palmero®. The company also operates four renowned golf courses: Pebble Beach Golf Links®, Spyglass Hill® Golf Course, The Links at Spanish Bay™ and Del Monte™ Golf Course. Its other famed properties include scenic 17-Mile Drive®, The Spa at Pebble Beach™, Pebble Beach Golf Academy™ and Pebble Beach® Equestrian Center. It annually hosts premier events such as the Pebble Beach Concours d’Elegance®, AT&T Pebble Beach Pro-Am, TaylorMade Pebble Beach Invitational presented by DELL EMC, Pebble Beachsm Food & Wine and the PURE Insurance Championship. Future site of the 2018 U.S Amateur Championship and 2019 U.S. Open Championship, Pebble Beach Golf Links® has hosted five U.S. Opens, four U.S. Amateurs, one PGA Championship and numerous other tournaments. For reservations or more information please call (800) 654-9300 or visit pebblebeach.com. About IBM Watson: Pioneering a New Era of Computing — Watson represents a new era in computing called cognitive computing, where systems understand the world in a way more similar to humans: through senses, learning and experience. Watson continuously learns from previous interactions, gaining in value and knowledge over time. With the help of Watson, organizations are harnessing the power of cognitive computing to transform industries, help professionals do their jobs better, and solve important challenges. For more information on IBM Watson, visit: ibm.com/Watson and ibm.com/sports.